Gordon Hayward is back in town for Friday’s Jazz-Celtics game. Over a year later, has the sting of his departure subsided? Is it that he left? Or how he left? We know this: Gordon Hayward returns to Vivint Arena for the first time on Friday since he left the Utah Jazz over a year ago in what was the most crushing free agent departure in franchise history. We know that fans are eagerly anticipating the game. Simeon Mismash, a Jazz fan from Sandy who attended Wednesday’s game against the Mavericks, says he’ll be full throat for Hayward’s return. Mismash isn’t alone. Utahns, both online and when you ask them in person, still seem sore about Hayward’s departure, even as the 2017-18 team matched the success of the Hayward-led group from the year before. Hayward was an All-Star for the Jazz in his final season, leading them to their first playoff appearance in five years, their first playoff win in seven. Jazz assistant coach Johnnie Bryant had worked tirelessly with Hayward to develop his game; meanwhile, head coach Quin Snyder turned his offense into a Hayward-focused laser. By the time free agency rolled around, everyone realized that Hayward was hugely important to the franchise. Fans chanted his name in the playoffs, begging him to stay. They contributed an estimated $50,000 to a billboard campaign, resulting in signs scattered across the valley with #Stayward messages. Elementary and junior high school classes sent Hayward letters, begging that he stay. The community rallied together to keep this one man, the one who had grown up in front of them, in Salt Lake City. But what’s remarkable about the Hayward story is that in the eyes of nearly everyone impacted by Hayward’s departure — fans and Jazz leadership alike — what hurt most is not that Hayward chose Boston over Salt Lake City; it was the way he departed. It’s always difficult when a star player leaves in free agency, but recent departures by Paul George, Kawhi Leonard, and Chris Paul from their teams showed just how much the Jazz lost out on by having Hayward wait until the offseason to make a decision. Paul George informed the Indiana Pacers that he planned on departing the franchise the summer before he was to become a free agent, giving them time to get value back for George. They did — acquiring young All-Star Victor Oladipo and sweet-shooting big man Domantas Sabonis from Oklahoma City. Leonard broke San Antonio hearts when he didn’t play for most of the 2017-18 season, then demanded a trade. But the Spurs acquired an All-Star in return, DeMar DeRozan, in exchange for the final year of Leonard’s contract. You’ll hear about those examples when you talk to Jazz personnel privately about Hayward’s departure, though there are no guarantees the Jazz would have broken their playoff drought in 2016-17 had Hayward requested a trade like George and Leonard. But the Paul trade to Houston shows that Hayward had some latitude to help Utah on the way out. Like Hayward, Paul was an upcoming free agent, but had the option to opt in to another year on his contract. In the week before Paul was to become a free agent, Paul informed the Clippers that he wanted to leave to join the Rockets, and the two teams were able to figure out a mutually beneficial trade, including valuable role players and a first-round pick heading to L.A. The trade was completed three days before free agency began. Two days later, the Jazz traded for Ricky Rubio, but he wasn’t the only point guard the Jazz were considering. Besides the incumbent starter, George Hill, according to multiple Tribune sources, the Jazz spoke extensively to Toronto point guard Kyle Lowry’s representatives about bringing the All-Star point guard to Utah. After those discussions, the Jazz felt confident about their ability to land Lowry, but chose to pull out of any potential deal because signing Lowry would have required cap space earmarked for the Hayward. Lowry signed a new deal with the Raptors on July 3. Hayward didn’t commit. In fact, in a June interview on Utah Lt. Gov Spencer Cox’s podcast, Miller says Hayward didn’t ever call her, even after making his decision. On Decision Day, more opportunities came and went as the Jazz chased Hayward. After multiple reports, first from ESPN, then The Tribune, indicated that Hayward had chosen the Celtics, the Jazz quickly moved to plan B: a flight planned to make a pitch to Washington Wizards forward Otto Porter. But after agent Mark Bartelstein insisted that Hayward hadn’t made up his mind, Jazz management stayed on the ground. “We didn’t want to jump on the flight and not being able to communicate,” Lindsey told USA Today. Porter signed an offer sheet with the Brooklyn Nets that day, though the Wizards matched. Later in the afternoon, the Clippers agreed to trade the first-round pick they’d acquired in the Paul trade for Danilo Gallinari, another Jazz small forward target in the case of Hayward’s departure. Asked about his options at the small forward position on July 6, Lindsey said this: “Getting some wing size and getting that replacement would be very key, but again, there's not as many prospects on the board because of the timing." The irony is that what looked like a mess at the time turned out just fine for the Jazz. Though Thabo Sefolosha was the Jazz’s major small forward acquisition, Ingles stepped up for the starting small forward minutes. Donovan Mitchell turned out to be a revelation as a rookie, taking over Hayward’s scoring duties. The question still remains about what the Jazz could have done with Hayward in tow, or with assets acquired for him, but overall, things have turned out pretty well. Despite that, fans on Friday are still expected to do some venting, maybe more offended at what transpired than the end result. “I would give him the silence he gave Gail and the Jazz,” Jazz fan Diana Allen said. With so many fans committed to booing, a stadium-wide silence isn’t going to happen, and that’s an outcome that will probably please the ESPN cameras and sound engineers. But when asking the Jazz’s players, they’re clear on the subject: while this game might be critical to the fans, it’s not quite as important for them. 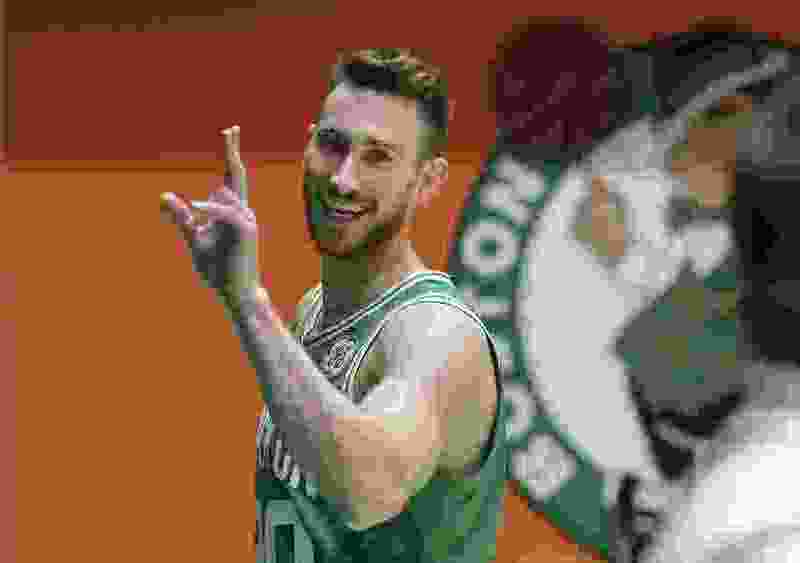 Whether it’s because of the time that’s passed since Hayward’s departure (nearly 18 months now), the injury that cost him last season, Hayward’s reduced role as he recovers, or just an embrace of a player’s ability to make decisions for himself in free agency, the players say that they don’t have Friday night circled on their calendars. Jae Crowder has a unique perspective on the game. Two years ago, Boston fans chanted Hayward’s name when the Jazz were in town, though Crowder played at Hayward’s position for the Celtics at the time. He remembers that game fondly. And for the mild-mannered Derrick Favors, it’s even simpler that that. “I texted him after he said he was going to Boston,” Favors said. “We talked a couple times when he played here, but after that, that was it. Tipoff • Friday, 7:30 p.m.
About the Jazz • They snapped a four-game losing streak and won their first home game of the year with Wednesday’s 117-102 victory over Dallas. … Donovan Mitchell is averaging a team-best 22.4 ppg on 43.8 percent shooting. … The Celtics will conclude a three-game homestand for the Jazz, who will begin a five-game road trip on Monday in Memphis. About the Celtics • It will be Gordon Hayward’s first game back in Utah since leaving the Jazz in free agency in July 2017. He is averaging 10.1 ppg (on 40.2 percent shooting), 5.8 rpg, and 2.2 apg. … Going into Thursday night’s game in Phoenix, Boston ranked first in the NBA in allowing just 101.3 ppg. … Conversely, the Celtics’ offense has struggled, with their 103.5 offensive rating ranking fourth-worst in the NBA.